Only a few more days until the end of the 16th International Architecture Exhibition – La Biennale di Venezia. Only a few more days until the end of the 16th International Architecture Exhibition – La Biennale di Venezia. If you still want to visit or you won’t have time to see FREESPACE here is a selection of some of the highlights of the Arsenale. It is almost six months since we were in Venice to see a preview of the various pavilions and participations in the 16th International Architecture Exhibition – La Biennale di Venezia called FREESPACE, the theme chosen by the curators, Irish architects Yvonne Farrell and Shelley McNamara (Grafton Architects). With its conclusion approaching soon, we would like to briefly recap our impressions, described through the exclusive shots taken by the German photographer Ken Schluchtmann for Floornature. We begin our two-part review with the Arsenale and here, of course, with the Italian Pavilion, Arcipelago Italia (link), curated by Mario Cucinella MC A and set up, as usual, in the Tese of the Arsenale in Venice, where the key elements of Cucinella’s research are exhibited, exploring how architecture can provide opportunities to give our country a new lease of life. The floor and wall coverings of the Iris Ceramica Group are located in the Tesa Maggiore where it contributed its materials to craft a 10-metre long backdrop made up of 300x100 cm high-tech ceramic slabs. The structure was customised with the use of the Group’s innovative DYS - Design Your Slabs technology made to a hand-drawn design by Mario Cucinella, which fills the space and demonstrates the design concept and the areas of action selected to the general public. One of the most eye-catching national participations is without a doubt Argentina entitled Vértigo Horizontal curated by Javier Mendiondo, Pablo Anzilutti, Francisco Garrido, Federico Cairoli. 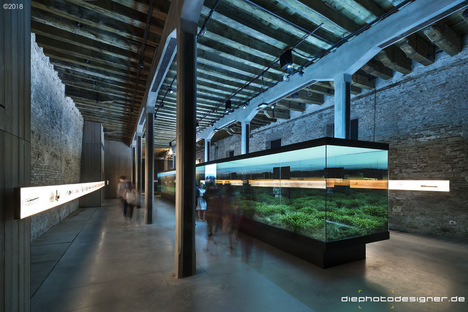 A kind of terrarium runs along the centre of the Argentine pavilion, a large mirror garden that houses a piece of the Pampas, including the native vegetation and an animated sky, in the heart of the Arsenale. The goal is to highlight the many parks and social spaces created since the country’s return to democracy in 1983, sketches of which are displayed on the walls. Take a look at the dedicated article for Chile because it presents a very interesting and very historical approach to the Freespace theme. At the Artigliere in the Arsenale, in addition to the poetic participation of Indonesia (link) and the debut of Lebanon (link), we were impressed by Albania’s proposal. Hapësira Zero Space interprets Freespace as the liberation of spaces on the ground floor of the capital city of Tirana where citizens have taken the initiative by transforming these places from private to public space with cafes, shoemakers, barbers and tailors. Actions that occurred in complete freedom, without conventional territorial planning. The active engagement and sense of community engendered a lifestyle based on opportunities and that has now become part and parcel of the city itself. There were also plenty of interesting installations in the Corderie where the visual standout was the one by the Danish architect Dorte Madrup with Icefjord Center. An invitation to experiment with unique elements located in the nature of Greenland with an abstract 1:12 model inside an immersive installation of lights and sounds. This experience is supplemented by a smaller model and by a video. The colourful, welcoming contribution designed by the architecture firm Benedetta Tagliabue-Miralles Tagliabue EMBT, called Weaving architecture sums up a mindset based on the experimental work of Benedetta Tagliabue and EMBT through the years, starting from the wicker Spain Pavilion at the 2010 Shanghai Expo. The concept of weaving is expressed at the Corderie in various forms and offers a welcome place to relax after a tour of the Arsenale for the 16th International Architecture Exhibition - La Biennale di Venezia.